I love potatoes! They’re such a versatile vegetable, and inexpensive too! I admit, I’m kind of partial to French fries, but I love them roasted, baked, mashed, in soups and as an addition to hearty main dishes. 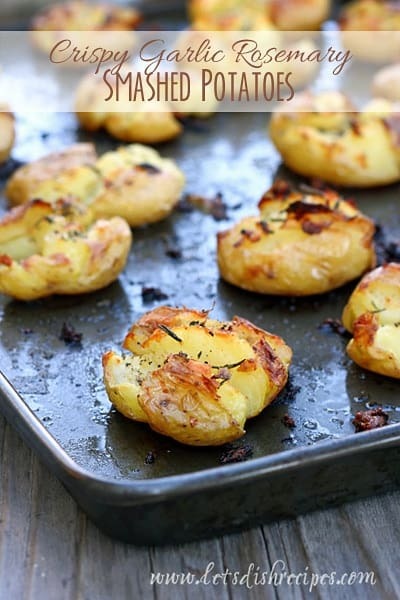 And I really love these Crispy Garlic Rosemary Smashed Potatoes! I always know that potato dishes will go over well with my kids too, which makes them even more appealing (no pun intended!). They’re readily available year round, but you can find the best variety at your local farmers’ market. I’ve seen this recipe for smashed potatoes many times over the last few years. I think it all started with the Pioneer Woman. It’s a recipe I’ve always wanted to try, but for some reason I never got around to it until now. What was I waiting for? 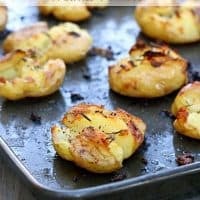 These potatoes are amazing! Even better than I expected. I loved most was how the skins got so crispy, while the insides stayed soft and tender. You could really add whatever herbs you like, but garlic and rosemary are a great place to start. Be generous when you drizzle your pan with olive oil. Not only does it keep the potatoes from sticking, it helps them get all crispy and delicious! Just make these. You won’t regret it. Place potatoes in a large pot and cover with water. Salt the water generously. Bring to a boil and cook until potatoes are fork tender, about 20 minutes; drain and cool slightly. In a small bowl, combine melted butter, garlic and rosemary. Drizzle a large sheet pan with olive oil. Arrange potatoes on the pan, leaving about an inch of space between potatoes. With a potato masher or fork, press down on each potato until it flattens, but is still held together by the skin. Drizzle the butter mixture over the potatoes. Sprinkle with additional rosemary, if desired. Season with salt and pepper. Bake for 20-25 minutes, or until potatoes are golden brown. Pendleton said: “Louis is going to be a very strong contender in the competition, he’s got some serious skills already. These not only look delicious, they are delicious. I’ve made these a couple of times now. We love them. I love these…… Did ok ‘smashing’ them….. But wonder if there is a ‘technique’ for holding them together. Some of mine held together. Some did not. Still, I’m not derrred from making these again, as they were yummy.